Marmot Bolt UL 2P Tent. When you're heading for the next checkpoint backpacking on a thru-hike and space, weight, and time are at a premium, the Bolt Ultralight 2-Person Tent is what you want in your pack. At just over 2 pounds, this freestanding, 3-person ultra-lightweight tent offers plenty of headroom, thanks to the zone pre-bend construction that creates vertical walls and strategic clip placement that adds more interior volume. 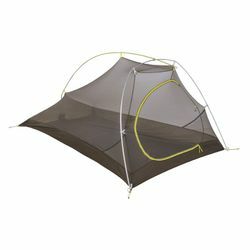 A seam-taped full-coverage fly with vents and a catenary-cut floor ensure you'll stay dry and water won't pool inside when you're camping. A lampshade pocket holds your headlamp for nighttime lighting while the interior pockets keep small gear organized. A D-shaped door makes it easy to get in and out. Color-coded "easy-pitch" clips and poles ensure a quick setup.